Bringing Blog articles we find that are of interest. Studies have shown that email still has a safe place in the business world, with an estimated 124.5 billion business emails sent and received each day. However, are the emails that your business is actually receiving safe? If you aren’t adopting the following practices in your daily business operations, they probably aren’t. With the right precautions, you and the rest of your team can keep your systems safer than the average business is from the threats that use email to propagate. Here, we’ve assembled some tips and practices to help you avoid email-based threats during your workday. 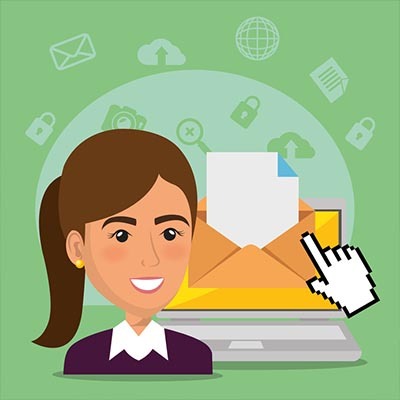 Your employees have a job to do, one that (most likely) doesn’t include them prospecting their email accounts to determine if an email is safe to open or not all day long. In order to ensure that they at least have a chance of accomplishing things that are actually on their schedule, you should implement spam-blocking filters and antivirus software. These options are highly effective at blocking email-based threats, cutting back on the amount your employees need to worry about (but by no means eliminating the concerns). In order to avoid the threats that remain, you need to ensure that your staff is using its email intelligently. While the filters we just discussed will help immensely, you also need to impress upon your staff the importance they have in your security equation. As the backbone of your operations, your employees hold significant influence over how effective your IT security is. This is why cybercriminals so often turn to them as the way into your network. To keep your business safe, you need to make sure that your staff members are capable of spotting something “phishy,” and understand the procedures you have in place to avoid threats like these. Avoid sending sensitive information over unencrypted email, and even then, send it only if absolutely necessary. Disregard and delete unexpected emails from unknown contacts. Bonus “ignore” points if their messages are misspelled or they have an unsolicited attachment. Avoid giving out your email if you can help it, or keep separate accounts going to avoid a threat sneaking into your actual, company-provided professional email. Every user needs to utilize sufficiently secure passwords that they keep to themselves and change fairly frequently. This will help prevent unauthorized access to the account if an old password were to be leaked. Two-factor authentication is important here too. Log Out When You’re Done! If you ever find yourself in the position where you absolutely HAVE to use a publicly-accessible device to do work with your email, you need to do a few things. First, ask yourself if the task is really so important that it can’t wait until you have access to your own device on a secured Internet connection. If it really can’t wait, make sure you log out of everything you accessed on the public device, ideally wiping the history and the cache before fully restarting the machine. For the sake of user convenience, computers and programs are now inclined to remember credentials and passwords, which is a dangerous thing to happen on a public device. Make sure that the device isn’t retaining any of your information before you leave; or, ideally don’t use a public device at all. BizEdge can offer you the solutions you need to keep your company email secure. To learn more, reach out to us at 844-BIZ-EDGE. Preferred Vendor & Accepting PayPal! BizEdge can now be your preferred hardware or software vendor! Anything hardware or software related we can provide a competative quote. Contact Sales now for all your hardware and software needs. We now accept PayPal! You can login, above, to view and pay your invoices. Contact Billing for more information or assistance. Learn more about what BizEdge can do for your business. Copyright BizEdge. All Rights Reserved.